I came on this project with a double role, Level and Narrative Designer. On the first week, I set a “typical Kaiju Snap experience” model with a storyboard and some key points presentation. With the basic ideas given with the pitch, I structure those elements on a first scenario and keys elements for the game experience. Starting there, I worked in collaboration with the Game Designer of the project on the creation of a vertical slice, representative of our game. I used excel tabs (challenges and elements repartition), maps with multiples layers and legends, powerpoint/google slide presentations, storyboard, design posters (One Page Design) and rough Unreal scenes (greybox/blockout). 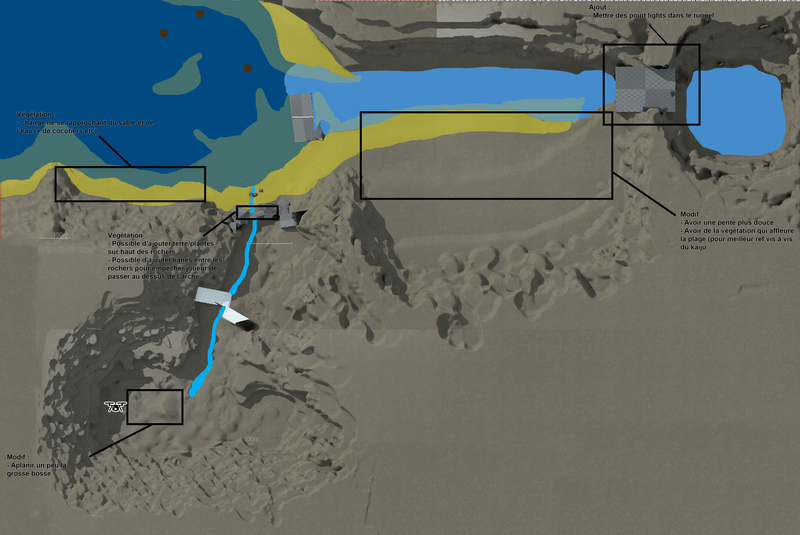 I mixed Rational Level Design with a more systemic approach of the world and level building. I also designed some guidelines for our episodic model and wrote summaries of scenario and gameplay elements of the following episodes. Our entire Game Design Document is available here: Kaiju Snap GDD. 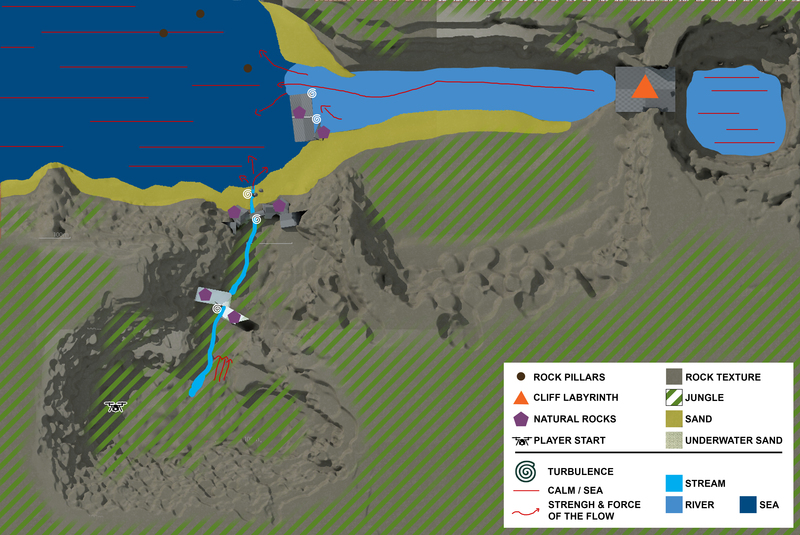 A rough map of the vertical slice I draw. 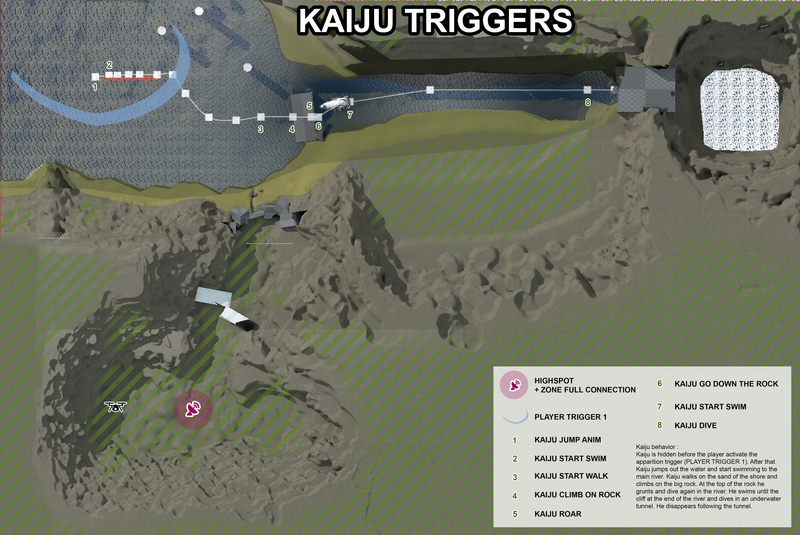 to have a general idea of the level layout, the Kaiju and the drone paths. Blockout I made for our vertical slice, water levels, stream, and creature movement spline were added at the same time. General map of the 1st island I draw to set the different places, with the path the player will follow during this episode. Dialogs I wrote for this vertical slice. One Page Design I made for this 1st episode. Kaiju snap is a solo game where you take control of a drone using your preferred VR headset and a game controller. You use the drone to take pictures of the fauna and flora. 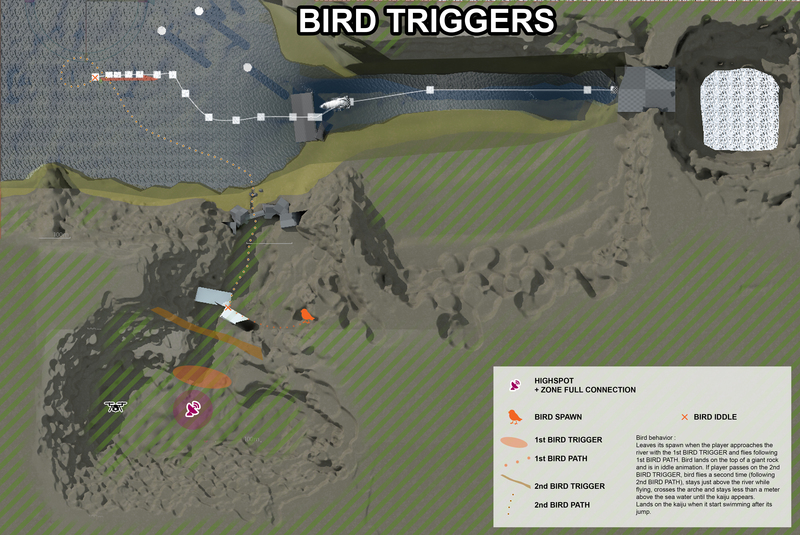 In this game you have a documentary approach to your objectives: you are here with a specific mission to fill, take pictures of a unique wildlife. We set the game on two important pillars: Marvel and Control. Our core gameplay is taking pictures of fauna and flora of the island while searching for some hints of the presence of a giant a mysterious beast. Those hints lead the player to specifics zones where he/she can encounter the creature and take photographies of it.